Starting next month, Star Cruises will become the first international cruise line operator to homeport in Sanya. With Sanya as the homeport, SuperStar Aquarius will offer two- and three-night destination cruises, calling at popular Vietnamese ports Halong Bay, Danang and Huế. 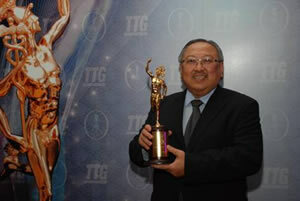 Mr William Ng, Chief Operating Officer of Star Cruises, receives TTG Asia Awards “Travel Hall of Fame” Inductee trophy in Bangkok. Star Cruises, the world’s third largest cruise operator, has been recognized as a “Travel Hall of Fame” Inductee by TTG Asia Awards for the fourth consecutive year. The prestigious accolade is one of the travel industry’s pinnacle recognitions for an outstanding leader that has won the same TTG Asia award at least 10 consecutive times.